Bradley Arant Boult Cummings LLP partner Lela M. Hollabaugh has been named by Who’s Who Legal as one of the world’s leading life sciences attorneys and is listed in the Product Liability chapter of the 2019 edition of Who’s Who Legal: Life Sciences. Hollabaugh is managing partner of Bradley’s Nashville office and a member of the firm’s Litigation Practice Group and Life Sciences Industry Team. She has served as the lead trial lawyer in more than a dozen jury trials, as well as more than two dozen bench trials, arbitrations and administrative hearings. She represents leading pharmaceutical, medical device and other product manufacturers in matters ranging from individual lawsuits to mass tort cases. The 2019 edition of Who’s Who Legal: Life Sciences is scheduled to be published in March 2019. Legal Aid Society of Middle Tennessee and the Cumberlands, Tennessee’s largest nonprofit law firm, has named Art Rebrovick, president of Nashville Management Group and Compass Executives, will serve as the community campaign chair for its 2018 Campaign for Equal Justice fundraising campaign. This year’s goal is to raise $826,000 to support Legal Aid Society’s mission to advance access to justice across Middle Tennessee and the Cumberland Plateau. The community campaign chair supports this initiative by overseeing fundraising efforts to donors outside of the Middle Tennessee legal community. Rebrovick founded Nashville Management Group and Compass Executives in 2001. He also has served as lead director of The Bank of Nashville since 2007. Previously, he was president of Warner Street Company from 1988 to 2001 and vice president of Singer Sewing Machine Company from 1987 to 1988. He served as president of Cutters Exchange from 1985 to 1987, starting with the company in 1973. Rebrovick earned his MBA from Vanderbilt University’s Owen Graduate School of Management in 1980. He graduated from the Georgia Institute of Technology with a bachelor’s degree in 1973. He has previously served on Legal Aid Society’s Community Advisory Council and was the 2014 community co-chair of the Campaign for Equal Justice. The Tennessee Latin American Chamber of Commerce has selected Victor Berrios president-elect, succeeding Marcela Gómez, who had been president of the board since December 2014. Berrios is a master franchise owner of Jani-King of Tennessee and is the owner and president-CEO of Titan Franchising LLC and River City Franchising LLC. Gómez will remain on the board of directors for ELLA, a non-profit organization supporting Latina business owners. ELLA began as a TLACC initiative under Gómez’s term. Karla Vazquez was named vice-president. Vazquez is the development manager for the United We Dream Network, the largest youth immigrant advocacy network in the nation. Delfine Fox, CEO of insurance company DFOX LLC, was named chairwoman of the board. Claudia Barajas, community engagement manager at the Office of Patient and Community Education at Vanderbilt-Ingram Cancer Center, was named chair-elect. The new TLACC executive committee also includes Ivan Figueredo, treasurer, and Ralph Levy Jr., legal counsel. The committee will serve a three-year term starting Jan. 1. Nashville Public Television recently promoted two staffers and welcomed another back to the city and station. Bridget Kling returns to Nashville and to the staff as senior director of broadcast content responsible for the broadcast schedule on NPT’s three on-air channels. She also is in charge of local content production for broadcast and digital platforms. During her previous tenure at NPT, Kling produced Beautiful Tennessee, Christmas at Belmont, The Fugitives, Arts Break and other long- and short-form programs. She held various positions, including director of program development and director of special projects. During her earlier nine years at the station, Kling received a Midsouth Regional Emmy, a national Gracie Allen award and National Educational Telecommunications Association awards. She also received the inaugural Rising Star Award presented by the National Academy of Television Arts & Sciences and the Tennessee Film, Entertainment and Music Commission. Shane Burkeen has been promoted to director of brand & digital strategies at NPT. He joined the staff in 2016 and previously served as brand and digital content manager. During his time at NPT, Burkeen has implemented cross-departmental digital campaigns and has been responsible for refreshing NPT’s brand to better reflect the organization’s mission and core values. Suzy Hence has been promoted to associate producer/senior editor. Her new duties include producing NPT’s Arts Break interstitials about local arts organizations (she currently serves as host of the series) and A Word on Words interstitials focusing on authors and book-related topics. She also will be responsible for media management and editing workflow. Hence will continue to edit Volunteer Gardener and other NPT productions. She has edited documentaries in every NPT series during her 12 years at the station, including Aging Matters: Caregiving, Next Door Neighbors: Somali, and Children’s Health Crisis: Infant Mortality, for which she earned Midsouth Regional Emmys. MiChelle Jones, NPT’s communications manager, will become vice chair of NETA’s Communications Council Executive Committee in January 2019. She recently received a Richard E. Ottinger Scholarship to attend the 2019 NETA Conference and CPB Public Media Thought Leader Forum next month in Salt Lake City, Utah. A two-time National Endowment for the Arts writing fellow, Jones handles NPT’s publicity, advertising, promotions and social media. First Tennessee Bank has two new additions to its Private Client Services division, private client relationship managers Rob Hebert and Brad Gallimore. Hebert’s professional experience includes 12 years in asset and wealth management, with a focus on building prosperity for high-net-worth clients. He is a graduate of Louisiana State University, where he earned a bachelor’s and master’s degrees in business administration. Hebert is on the board of directors for the Tennessee Performing Arts Center, Nashville Sports Council and Watkins College of Art. Gallimore brings to his new role 20 years’ experience in the financial services industry, with a strong background in personal banking for high-net-worth clients. He holds a degree in business administration from Middle Tennessee State University. Hebert will be based at First Tennessee’s Franklin offices, while Gallimore will work out of Brentwood. 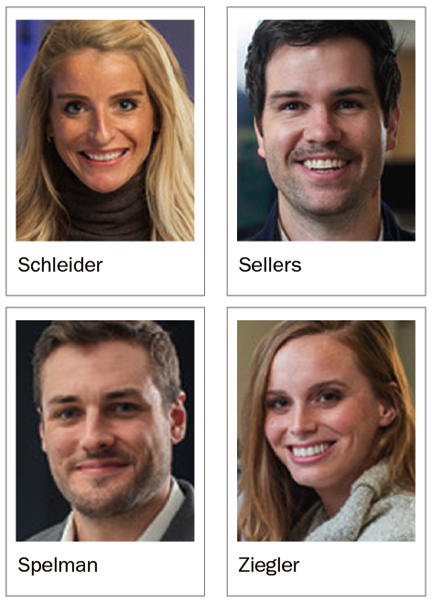 Nashville-based technology company Edgenet has promoted four staff members to head up national sales of its new enterprise PXM product, which it rolled out this year and is used by product manufacturers to manage the information they share with retailers, other distributors and eCommerce sites. -- Ben Sellers, from strategic account director to director of enterprise accounts. -- Philip Spelman, from national account manager to director of strategic accounts. Southern Land Company, a national real estate developer of award-winning mixed-use developments and master planned communities, has hired Kevin Holst as senior vice president and general counsel. Holst will head the company’s in-house legal department and will be responsible for supporting Southern Land’s development activity across its national footprint, which currently includes planned and under-construction multifamily and single-family projects in Tennessee, Colorado, Pennsylvania, New York, South Carolina, Texas, Florida and Nevada. Holst will be relocating to Southern Land’s Nashville headquarters for the role. He joins from McWhinney, a Colorado-based real estate development firm, where he served as vice president and & associate general counsel. His responsibilities there included legal matters related to multi-family development, commercial leasing, vertical commercial construction, industrial acquisition, and a 1,100-acre master planned community. Holst has spent 15 years in commercial real estate operations, including a senior director and assistant general counsel role with Vail Resorts Management Company. He holds degrees in history and political science from Saint Olaf College in Minnesota and earned his J.D. from the University of Denver Sturm College of Law. Tennessee Secretary of State Tre Hargett today has announced Jennifer Donnals will serve as the department’s director of communications starting Dec. 10. Donnals most recently served as director of communications and press secretary to Gov. Bill Haslam. Donnals joined Gov. Haslam’s staff in 2015 as press secretary and was appointed director of communications last August. Previously, she served in the Haslam administration as director of communications for the Tennessee Department of Safety and Homeland Security and also served as director of communications for the Shelby County District Attorney’s Office in Memphis. Donnals started her career as a broadcast journalist, working at television stations in Ohio, Alabama and Tennessee. Donnals graduated from Ohio University with a degree in communications. Williamson, Inc. recently appointed Stites & Harbison, PLLC attorney John Wingo to its 2019 board of directors. He will serve a three-year term. Williamson, Inc.’s vision is to partner for an educated workforce, to develop strong leaders in the community, to be an influential business advocate and to provide top-tier economic development. The board of directors helps to lead the strategic direction of the organization in building a prosperous business community. Wingo is a member of Stites & Harbison based in the Nashville office. As a member of the Business Litigation Service Group, he provides advice and representation to regional and national clients regarding their business transactions and handles commercial litigation defense work throughout Tennessee in both State and Federal Courts. He has more than 16 years of litigation and trial experience, including complex litigation involving financial institutions, insurance companies and manufacturers. Wingo also serves on the boards of Cumberland Region Tomorrow, Tennessee Business Roundtable and Transportation Management Association Group. He is a graduate of Leadership Franklin, Class of 2017-18.